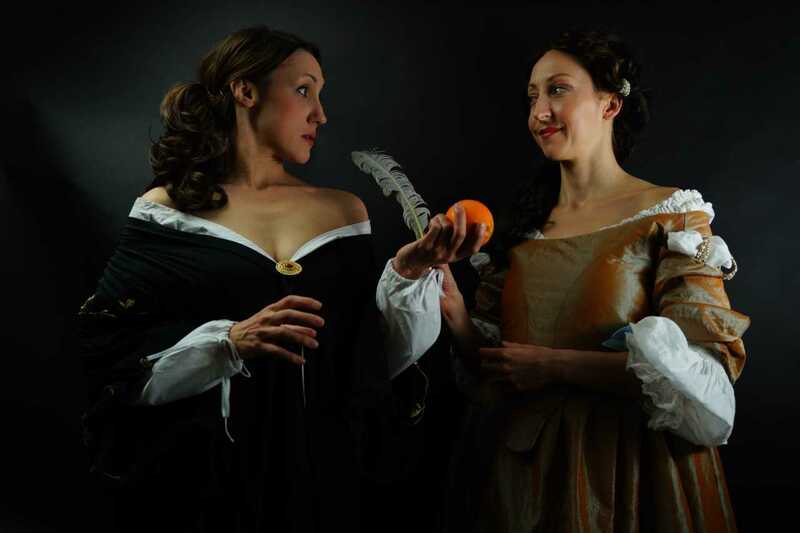 Sarah Lawrie as Nell Gwyn and Claire Louise Amias as Aphra Behn in Oranges & Ink. Photo © Claire Louise Amias. Claire Louise Amias’s Oranges & Ink charts the friendship between two Restoration heroines: Nell Gwyn, famous mistress to Charles II, and Astrea herself, Aphra Behn. Nell (Sarah Lawrie) and Aphra (Amias) are two halves of an iconic friendship, united by both the theatre and society’s ridicule. Writer and actress, mistress and mother, both women are labelled whore, but gratefully find solace in each other’s company. It is also understandable that Amias would find kinship in Aphra Behn, as a woman who finds pleasure in writing as well as acting. The Tristan Bates Theatre is the perfect location for this intimate look at Nell and Aphra’s (mainly imagined) relationship, and a sparsely dressed stage sets the scene for a charming yet thought-provoking performance. The costumes are lavish but prop choices are few and meaningful, such as the writing table at which Aphra writes a desperate letter to Nell upon hearing of her impending arrest after the publication of a scandalous play. The stage is lit by candlelight, creating an intimate atmosphere as the audience eavesdrops upon a most entrancing friendship. The delightful handbill-style programme credits this ‘illumination’ to Steve Lowe. Other notable credits include direction by Alex Pearson and music by William Summers and the Lovekyn Consort, which punctuates each scene change brilliantly. Once a humble orange-seller and now a famed actress, Nell earns the favour of the King and a place in his court, as well as his bed. Comfortable in society at her home in Pall Mall, Nell is visited by Aphra, who seeks her patronage for a new play, The Feign’d Curtizans (1679). Concerned with the possible implications of being associated with a work so political, she is hesitant. Rumours of Popish plots consume the public and Nell is rightly worried about the possibility of backlash against her or her sons if she were to publicly endorse a work in which English cavaliers are seen married off to Italian prostitutes. Despite the already licentious plot of Behn’s earlier and most popular theatrical work The Rover (1664), The Feign’d Curtizans appeared veritably more libertine in nature, representative of Behn’s close association with figures such as the Earl of Rochester. In one charming scene of our current stage, Gwyn and Behn reminisce upon their friend, toasting a full cup of wine to his ever-active ‘pen’. Clearly a play for the eighteenth-century enthusiast, the production references various forms of so-called feminine sociability: home visits, picnics, letter-writing, and the gaming table. The true chemistry between Lawrie and Amias make the women believable both as individuals and as close friends. The production makes use of various true events in the women’s lives; however, beyond Behn’s dedication to Nell in The Feign’d Curtizans, there is not much evidence to suggest such a relationship existed to this extent. But ‘pretty, witty’ Nell was the kind of woman who could work the system to her advantage, a skill in which Aphra, as the first professional woman writer, also excelled. Lawrie’s Nell is so personable, and her enchanting and comical personality is wonderfully complemented by Amias’s Aphra, a character led by reason and passion in equal measures. The original dedication to Nell admires the ‘Power of that Illustrious Beauty, the Charms of that tongue, and the greatness of that minde, who has subdu’d the most powerfull and Glorious Monarch of the world’. To Behn, even Nell’s role as a mistress becomes exemplary of her wit. Later critics – the most famous being Samuel Johnson – would find Behn’s suggestion of Nell’s power over the King nothing but ‘hyperbolical adulation’ worthy of Dryden. Indeed it would have been dangerous to suggest that ‘little Nellie’ was whispering in Charles’s ear, especially considering the popularity of such a suggestion amongst his detractors. Although they shared an acquaintance in John Wilmot, there is no evidence that their admiration was as mutual as Oranges & Ink suggests. However, the tradition of dedication dictates that Behn may have received some kind of customary payment from Nell, even if she had not watched a performance or even heard the manuscript read aloud. But of course, fidelity is beside the point and wholly unimportant to the performance’s enjoyment value. The production’s occasional factual plot points seem secondary to the depth and development of this contrived, but engrossing, platonic love story. After all, who does not want to imagine Gwyn and Behn discussing the theatre, the King, and Aphra’s Sapphic love affairs over a summer picnic? In one meta-theatrical moment, Nell and Aphra perform a scene from Behn’s own The Second Part of The Rover (1681). Nell is thrilled to discover Aphra has taken up her suggestion of writing a sequel and excitedly asks if it is to be another revision of Killigrew. During a performance at Windsor, Nell takes up the role of Spanish courtesan La Nuche and Aphra dons britches and a false nose in a lively rendition of ‘rake hero’ Wilmore. Once the skirts are removed, Aphra can fulfil her role as a libertine; the trousers bringing with them a freedom both social and physical. This powerful use of primary source material works well for the end of the performance and flows impeccably from the play’s main narrative. I was initially concerned that some of the Restoration language would be isolating to a more general audience, but overall this scene stands as a playful ending to a most fanciful imagining of two of the Restoration’s most famous professional women. Aphra Behn, ‘Epistle Dedicatory’ in The feign’d curtizans, or, A nights intrigue (London: 1679), Early English Books Online. Samuel Johnson, The lives of most eminent English Poets; with critical observations on their works, 4 vols (London: 1781), II, p. 92, Eighteenth Century Collections Online. Oranges & Ink, written by Claire Louise Amias and directed by Alex Pearson, is at the Tristan Bates Theatre, London, until 6 April 2019.